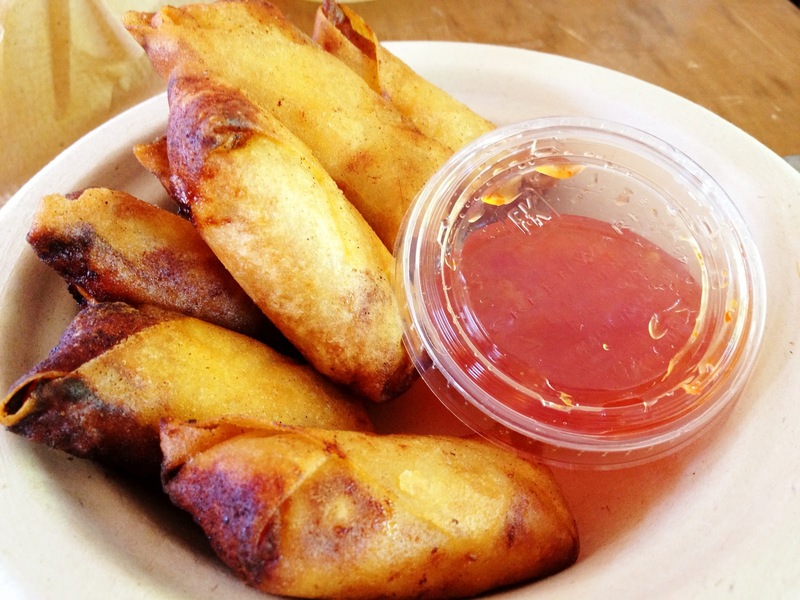 Evolution of a Foodie: Sacto MoFo! Sacto MoFo! Ok, so this event is put on by the fine folks at Sacramento Mobile Food. It was my first time hearing about it, since I am a newly indoctrinated food truck addict. 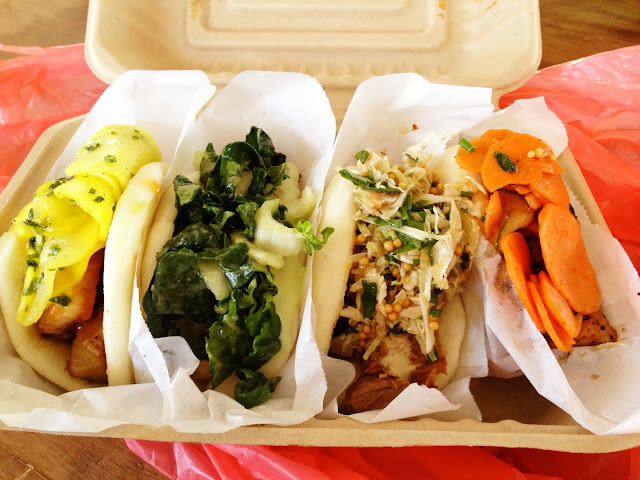 But, I was very excited to hear that my local city, Sacramento, would be doing a food truck event, with dozens of trucks, including many of my favorites from the Bay Area. It's located under a freeway overpass, which is actually a brilliant place for this kind of event (except for the traffic noise). It was shady, there was parking, and they set up tables and chairs to eat at. There was some pretty loud and awful live country music, and the table we sat at was fairly close to it, but I don't even remember the noise now. I just remember the food. With these kinds of events, you have to come with a strategy. Our strategy was to get there an hour before it started, get parking in the small, but very close parking lot, come with several other people, and have each person get in line for a different truck you want to try, and then swap food all around. Oh, and have someone who gets out of line first, save a table for everyone else. So, I went with my mom (since B couldn't make it) and it was her first time eating at a food truck! She also invited a friend from work who came with her family. We ended up having the 3 of us waiting in different lines, and got to a table, saved seats for everyone, ate, and then my mom's friend went her own way. Then it was just my mom saving our seats, and me getting more food as the lines grew and grew. Our first stops were Chairman Bao and Seoul on Wheels. I was in the Chairman line, only 3 or 4 people back, which was very lucky, as the line quickly grew to go all the way past several other trucks. I ordered all four of the steamed bun options at Chairman, the only one I hadn't tried before was the tofu bun. I shared these with my mom, and she liked the tofu one a lot, didn't care for the spicy chicken as much as I do, she thought it was too hot! 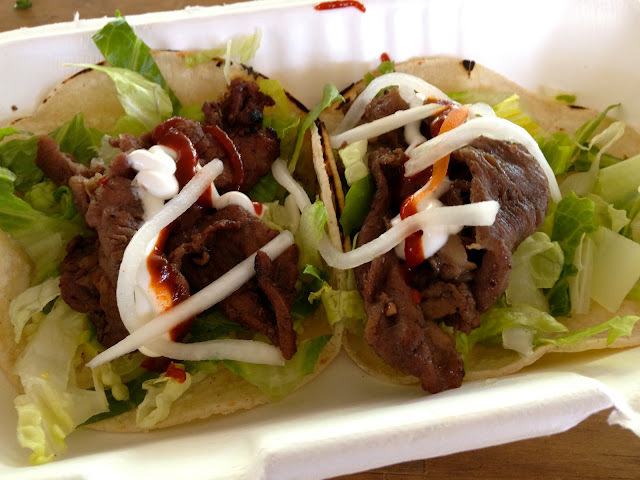 Next up, were the Bulgogi Korean Tacos from Seoul on Wheels. Now, I've tried some of their food before when B ordered it once, and didn't see it as that exciting, but these tacos were very good! I'm kind of sad I didn't try the Korean Fried Rice, I think it's their specialty, but another time. Despite the tacos looking very sparse, they were full of flavor, but small. It was kind of what we needed though, something small. Hapa SF was also there, and I wanted my mom to try their lumpia. We have a family friend who is Filipino and I wanted her to compare the one's we've tried and these. They were very busy, and ours seemed a little burnt on the edge, but were still delicious. 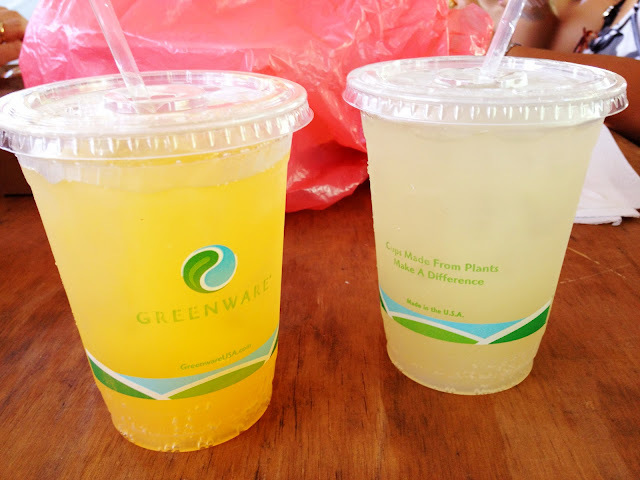 I also ordered us some fresh sodas from Hapa, the Mandarin Orange and Ginger sodas. They don't do the sodas everyday, but the ginger one was my favorite! It was like an authentic ginger beer, and spicy, refreshing and delicious. I was tempted to go back and order another. Next up was Sanguchon. Now, I was very disappointed by the wait in line I had for this truck. I felt bad for my mom, who waited alone at our table, while I stood in line for over an hour! I think I ended up ordering the Lomo Saltado, but when I got my food, it seemed like some of the toppings were sparse, or left off all together. They may have even given me the wrong item, but I couldn't really tell. After I finally ordered, I proceeded to stand waiting for my food for at least 20 minutes. Health inspector came to check on their truck. All cooking halted for 5-10 minutes while they talked to him. This was while I was waiting for my order! 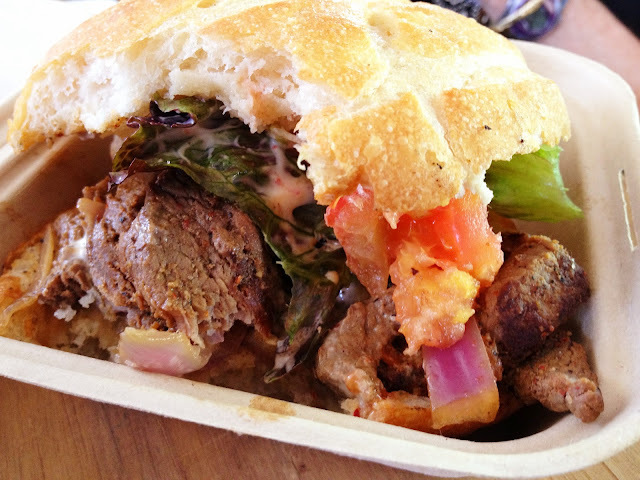 Eventually I got my sandwich, but I think a few people grew tired of the wait, and asked for their money back. When we finally ate it though, it was very good! Great, bold flavors, but I think I will have to try this truck again when they are under less stress and there's a smaller line. I also ordered the Alfajores from Sanguchon. I didn't eat these until I got home, because I was so full, but they were very good. 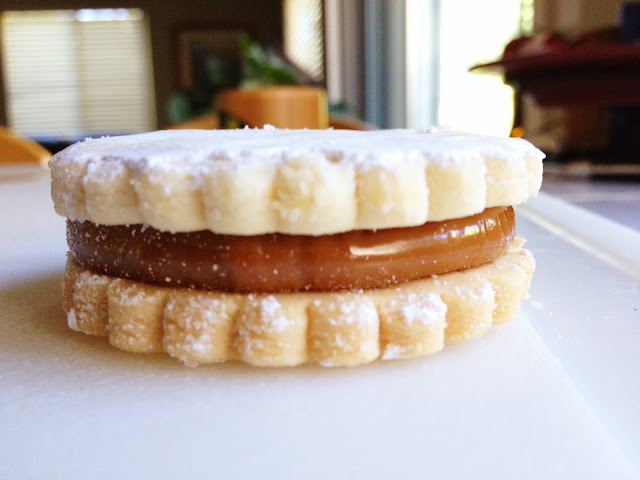 The dulce de leche didn't squirt out when I bit into them, and the cookies were soft and sweet. These I would order again.